Here is another immaculate example of this super Gift Set. 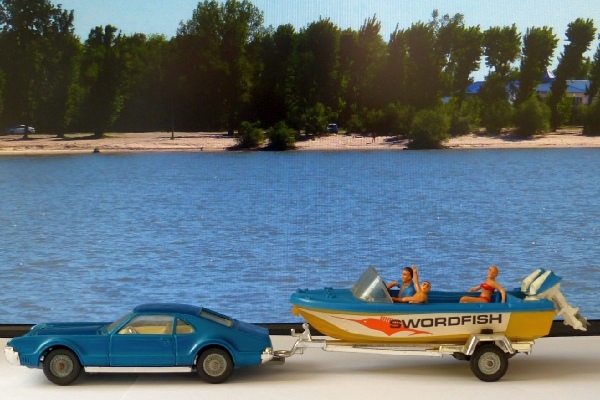 It comprises the first version of the Oldsmobile Toronado, this time in a distinct blue rather than the usual turquoise shade, a Glastron Swordfish twin engine speedboat on a chrome trailer and three characters. The driver and two girls are original (often missing from this set!) The car, trailer and boat are all like new. The light system works smoothly on the Oldsmobile and its grey plastic hook is intact. It is the cast wheel version, as are all the trailers in this set. The two outboard motors swivel up and have rotating propellers. The packing is polystyrene and this is complete and not split, with elastic bands holding the items in place. The box is fresh and bright with just some crumpling of the cellophane with age. This is a desirable set, hard to find now and a superb example.